11/2/12: Friday night the UVM men's hockey team got some musical support from The Fighting Catamount Band during their game against Providence. Since the '60's the official pep band for UVM's athletic teams has been helping crowds tap into their team spirit. 8/17/12: The Smittens celebrated the release of their fourth album, Believe Me, at Burlington City Arts Friday night. The local indie pop band recently returned from an overseas tour and are also celebrating a decade of making music together and a new band member, Missy Bly. Eva caught up with them the day before their show for an intimate acoustic rehearsal and chat. Disclaimer: The Smittens sing the Stuck in Vermont theme song and their music has been featured in numerous episodes. Eva also directed The Smittens music video for "Gumdrops." 8/4/12: Girls Rock Vermont is a week-long summer camp in its second year teaching girls ages 8-18 how to play instruments, write music and be in a band. Eva catches up with the rockers at their final showcase at Higher Ground last Saturday where Vermont's newest all-girl bands performed for a packed house. 1/2/12: The Renewal Chorus kicked off their 6th annual winter tour on a good note at the Church of Our Saviour in Killington on Monday night. 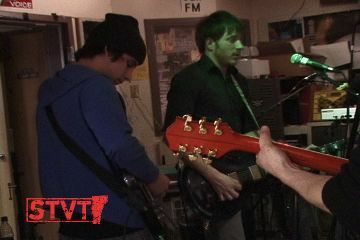 4/18/11: The Vacant Lots are a garage-psych duo that formed in Burlington during the summer of 2008. Three albums later, the band's line-up has changed (drummer Brian MacFadyen was replaced by Frank Zammiello), but their hypnotizing sound remains as they prepare to play at the the prestigious Austin Psych Festival at the end of April. Eva caught up with The Vacant Lots' frontman and lyrical poet, Jared Artaud, for an interview in the basement of Seven Days (complete with the band's signature projection of trippy images). Back in late February, she also filmed their performance at Club Metronome in Burlington. Music: The Vacant Lots, Hypnotized, "Confusion," "Cadillac," & "2009" and According to the Gospel, "Let Me Out"
6/8/10: On Sunday Grace Potter and the Nocturnals decided to return to their home state to launch their new album. On Tuesday the band held a massive, free concert in downtown Burlington as part of the Discover Jazz Festival. Hundreds (maybe even thousands?) of fans took over Church St to cheer on their hometown favorites who also just launched a chocolate bar with Lake Champlain Chocolates. 2/26/09: Gregory Douglass celebrated the release of BATTLER, his seventh album Thursday to a sold out crowd at Higher Ground. After 10 years as an independent singer/songwriter touring the country and performing at countless venues, it was a warm homecoming with guest vocalists Grace Potter, Anais Mitchell and Lisa Piccirillo. Other singer/songwriters interviewed about Greg: the producer of BATTLER, Syd, Antara and Mieka Pauley. 2/12/09: After School Rocks this winter at 242 Main where students play and compose music, form bands, and channel their inner rockstars in a 5 week camp. You can also watch this montage on YouTube. The Inner Fire District (MySpace) are hard to define. When pressed they call themselves Radical Yiddish Balkan Culture Folk but their sound sidesteps labels. Thursday night they celebrated May Day at the North End Studio in Burlington with two accordions, an upright bass, guitar, and a clarinet, tragically beautiful 100 year old songs and klezmer music that had the crowd stomping its feet. Call 911, the Inner Fire District will entertain you while your house burns down. 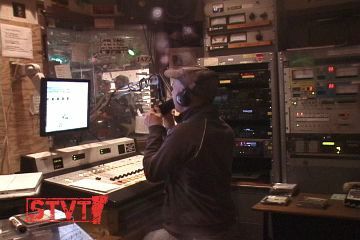 Dedicated students and community members make up the volunteer team who run WRUV, UVM's college radio station. Every Wednesday from 8-10pm, local VT bands play on a show called Exposure which has been running in one form or another since the 80s. 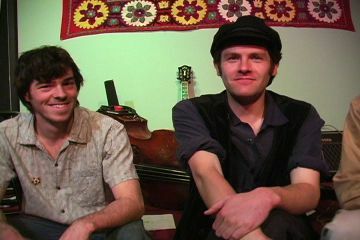 Exposure is currently helmed by Jeremy Ayers and Scottum Rosenblum and attracts a wide variety of musicians. On Wednesday, April 18th, 7 member strong, local indie pop band, The Hero Cycle played some delectable songs from their recently released LP "Lakes and Ponds." WRUV is currently located in the basement of Billings Student Center and will be moving to UVM's brand new building in the near future. *** Please note: Exposure needs interns so if you live in the area, drop them a line! Also, The Hero Cycle is hitting the road so come and see them at a show near you (dates listed on MySpace)! Delicious indie pop stylings courtesy of The Hero Cycle off their new album, Lakes and Ponds on the Aussie label Hidden Shoal Recordings. PS On a technical note, please note the improved compression (a work in progress mind you) and the tighter editing - thanks Art Bell!